The Professional tool for converting, creating and customising your PDF files! 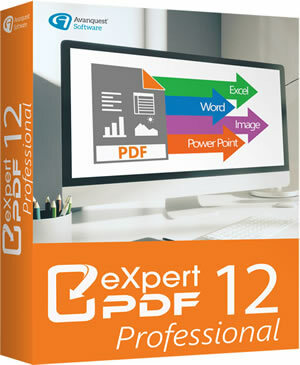 Expert PDF 12 Professional is the ideal solution to handle all aspects of PDF document management. This software can meet every single one of your PDF file requirements. With Expert PDF 12 Professional, you can do everything. You can convert your PDF file into other formats, add or remove pages, rework your document… The possibilities for modifying are endless, and just a few clicks away. With Expert PDF 12 Professional you can safely send invoices, administrative and legal documents protected by a password or a digital signature, or by the print, copy or modification authorisations you define. With Expert PDF 12 Professional, you can insert notes, comments or a stamp mostly without having to modify the content. This function comes in handy when several of you are sharing the same document! What’s new in Expert PDF 12 Professional? The Expert PDF 12 Professional version allows you to open and view all PDF files and 3D ebooks in ePub format. The time you save with Expert PDF 12 Professional is considerable, and automation is central to all its functions. You will find that batch conversion is also particularly efficient, as you can merge several documents into a single PDF document. Editing PDF files is child’s play with Expert PDF 12 Professional! Cut, copy, paste, move, delete any content or redo its properties (font, font size, character spacing) at will, edit your pictures (add, delete, modify a picture, compress or resize it) or add elements (hyperlinks, for instance)! You can quickly insert lines, ellipses, curves and other forms with the design tools, and print watermarks in seconds. You can also attach all types of files, such as audio or video files, to your PDF. Another advantage of the Expert PDF 12 Professional software is that you can create interactive forms. Automatically transform your PDF file into a PDF form that can be filled in directly online from a simple PDF reader. Customise your textboxes, form objects, buttons, checkboxes, etc. You can even insert scripts if you want to! And of course, you can allow automatic data entry and Web page opening with hyperlinks. With Expert PDF 12 Professional, importing or exporting data in the form fields in one PDF file to another PDF file is really easy. As we have seen, Expert PDF 12 Professional will be your new partner to modify your PDF file and to make corrections. Use the annotation tools (highlight, note, comment) or shape changer tools, or even use the pencil, corrector or highlighter to easily revise a PDF file. With Expert PDF 12 Professional, you can protect your PDF files with a password, manage access rights to your files, and add a digital signature to certify them. The software doesn’t stop there! It supports PDF ciphering with 256-bit RC4 or AES encryption algorithms.